For buyers and refinancing households throughout California , adjustable-rate mortgages are a relative bargain as compared to fixed-ones. According to Freddie Mac’s weekly survey of more than 125 banks nationwide, Coto de Caza mortgage applicants electing for a conventional ARM over a conventional fixed-rate mortgage will save 105 basis points on their next mortgage rate. “Conventional” loans are loans backed by Fannie Mae or Freddie Mac. Today’s average, conventional 30-year fixed rate mortgage rate is 3.91% plus points and closing costs. 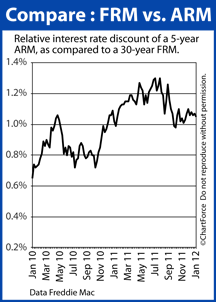 The average rate for a comparable 5-year ARM is 2.86%, plus points and closing costs. In other words, for every $100,000 borrowed, a conventional 5-year adjustable-rate mortgage will save you $58.15 per month, or $698 per year. That’s a 12 percent savings just for choosing an ARM. 12 percent is a big figure that adds up over 5 years — especially for households that plan to sell within those first 60 months anyway. There is little sense in paying the mortgage rate premium for a 30-year fixed-rate mortgage when a 5-year ARM is perfectly suitable. For the reason why adjustable-rate mortgages continue are so much lower than their fixed-rate counterparts, look no further than the U.S. economy. ARMs reflect Wall Street’s short-term economic expectations; whereas fixed-rate mortgages reflect medium- to long-term expectations. In the short-term, analysts expect the U.S. economy to grow slowly, with low levels of inflation. This supports the U.S. dollar, the currency in which mortgage bonds are denominated. When the dollar is strong, demand for mortgage bonds tends to increase. This supports lower interest rates. Conversely, over the longer-term, inflation is expected to return, which devalues the dollar and everything paid in it (e.g. ; mortgage-backed bonds). This is why inflation is linked to higher mortgage rates. When inflation is present in the economy, mortgage bonds lose value, driving mortgage rates up. Adjustable-rate mortgages aren’t perfect for everyone, but in the right situation, they can be a big money-saver and a helpful tool for stretching a household budget. Given today’s rates, the money-saving potential is larger than usual. Before you choose an ARM, discuss your options with your loan officer. « Are You Locked ? Friday’s Job Report Will Make Mortgage Rates Move.